way to go B man ... good job sir ! Robin-XU wins the tournament and receives $8.85 - congratulations! dunkelelk finished the tournament in 2nd place and received $7.73. shakey1one finished the tournament in 3rd place and received $6.50. tom905 finished the tournament in 4th place and received $5.62. TigerCoRpse finished the tournament in 5th place and received $4.30. Playing game 5, tourney 661209527.
joy7108 wins the tournament and receives $7.80 - congratulations! wo.Nnn finished the tournament in 2nd place and received $7.58. Craneo WarZ finished the tournament in 3rd place and received $6.24. propoison finished the tournament in 4th place and received $6.17. stevefitz55 finished the tournament in 5th place and received $4.81. Thank you to all you horsies for your wonderful efforts this year. Because you've been so nice, I've asked Santa to fill your troughs with carrots, apples and sugar cubes (and to sneak a few bottles of your favourite beverages under the hay). eeeeeeeeee25 wins the tournament and receives $9.99 - congratulations! L.uki18L.uki finished the tournament in 2nd place and received $7.70. Alemonsinho finished the tournament in 3rd place and received $5.75. Alemão1941 finished the tournament in 4th place and received $5.30. tom905 finished the tournament in 5th place and received $4.26. Merry Christmas & Happy New Year, Tom! Nicely done! best hand was the A9 diamonds i had shortstacked .. went all in ..
Good try, Megg, nothing you can do if you're card dead. Those card dead games are going to happen to all of us. Just forget it happened and move onto the next one. Ditto, onto the nexts Best luck for it! Has to be better odds to win it eh! Stay Positive! mirgiglio wins the tournament and receives $3.31 - congratulations! deamon147 finished the tournament in 2nd place and received $2.97. 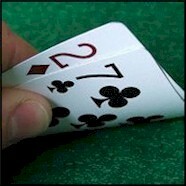 robinkutya finished the tournament in 3rd place and received $2.77. megg23 finished the tournament in 4th place and received $2.66. Iriishka wins the tournament and receives $4.28 - congratulations! megg23 finished the tournament in 2nd place and received $3.07. vili33 finished the tournament in 3rd place and received $2.45. MANUWAR666 finished the tournament in 4th place and received $2.09. Eightpanther finished the tournament in 5th place and received $2.01.